Howdy, friends! Last year I started a series on the blog titled "Such a Ginger Read" that highlights books I read that are definitely a me kind of book. Now, for those who don't know me, you may be wondering: What exactly IS a Ginger Read? There are lots of ingredients to this type of story, but if its got any of these, then you can definitely call it a Ginger Read: romance, emotional depth, set during the summer (bonus! ), and a contemporary storyline. I've already read my first #SuchAGingerRead of the year and we're only a week in. I know I'll be talking about this book a lot in the months to come, especially since it doesn't publish until May. It's a strong contender for being a total Ginger Read, and bonus points for it being set in my home state: Texas! About the book: It is a companion novel to Dumplin', which follows supporting characters from the first book in the months after Willowdean's star turn in the Clover City pageant. Anything Julie Murphy writes is a Ginger Read, and this one follows suit just like her previous novels have. 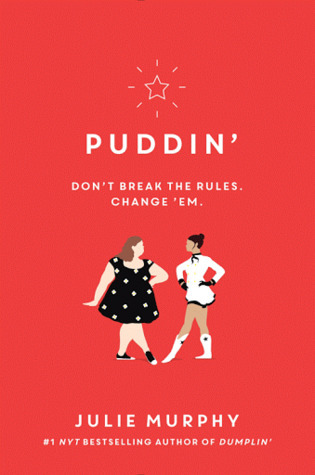 Puddin' is the follow-up (or companion) novel to Dumplin'. They are two different stories; however, I would still recommend reading Dumplin' first since there is a lot of character and storyline over lap. Plus, Dumplin' is amazing in its own right and you should read that story anyway! Puddin' focuses on two very different, yet very special characters we were first introduced to in Dumplin': Millie and Callie. I was drawn to both of these girls for separate reasons. They shine bright in their own right; especially when I found myself hating one, and loving an another. It's a testament to an author's craft when by the end of the novel you've developed a deep connection, and love, for both main characters, despite all their flaws. Julie Murphy has taken a story, that I feel so many are able to relate to, and gives it her own authenticity. It's a story about self-doubt and insecurities. But also about stepping out, and rising above it all, even when it's the most terrifying thing in the world. There is so much good in this story, one that I wish I'd had as a teen. Picking up a Julie Murphy novel feels like coming home, and it's especially home sweet home for me since this one is set in Texas. When it comes to YA contemporary, this is Such a Ginger Read! I am sooo jelous that you have already got to read this book lol!!! I cant wait til it comes out! I haven't ever read any Julie Murphy books but after loving her story in Meet Cute, I've been wanting to check out Dumplin!